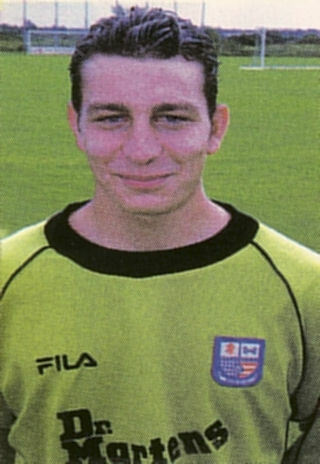 The young French goalkeeper Michael Bertocchi spent two seasons with the club as cover for Billy Turley. He had signed from AS Cannes in France on 11 August 1999 in the hope of breaking into English football. He made his debut in the FA Cup game at home to Sutton United in October 1999 with a five minute cameo role when Diamonds were leading 4-1. Unfortunately for Michael, he too was unavailable when Billy Turley served a suspension during the following season, and only made one further appearance, in the Hillier Senior Cup win over Corby Town. He failed to make any league appearances before he was released in May 2001 after Diamonds had reached the Football League. After he left, he had a trial for Chester City and played in a reserve game for Bolton Wanderers in October 2001. He conceded three goals in the opening half hour before being replaced and was not given a contract. He returned to France to play for Grasse in 2011 before retiring from the game.